Asha was born in England but has lived most of her life in Jordan. She was a teacher for twenty years and has always loved books. Her earliest memory of enjoying writing is when she was six or seven years old at school in Sheffield. The teacher had a box of cards with words on them. You could choose any card and use the words on the card to write a story. She loved reading Enid Blyton books like 'The Enchanted Wood', which is probably why the first book she wrote involved strange places and unusual characters. 'James's Journey: An Amazing Adventure' is the first of three. The second is 'James's Journey: Here We Go Again'. She is currently writing the third. 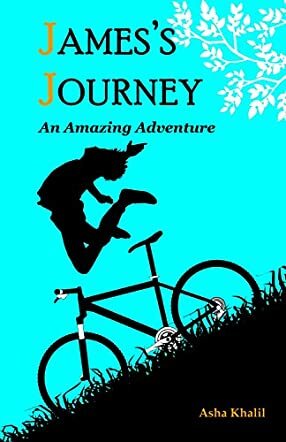 James’s Journey: An Amazing Adventure by Asha Khalil takes young readers along on a bicycle trip with James, who cannot wait to ride his new, bright red shiny bicycle. During the next couple of weeks, James spends every free minute learning how to ride his bicycle. James lives near the woods and one day he decides to take a steeper hill at the far end of the woods. He knows he is not supposed to be anywhere near the woods on his own. Something strange happens when James goes along the road. He sees a hole in the road, but it is too late and he has an accident. James tries to find his way home and strange things happen; the trees are all upside down, the houses are like upside down triangles, and a woman whom he meets is walking on her hands. Will James finally be able to reach home? This fantastical adventure story will take readers through many thrills and magical moments that will leave them enthralled and enchanted. The narration is detailed and descriptive, thereby making it palpable to young readers. Children will be hoping to experience the same adventure and magical trip as James when they ride their bicycles. It is fascinating to see ordinary people doing extraordinary things, making everything look bizarre and weird. It is a story children will enjoy reading and it makes a good story for classroom read aloud sessions because of the adventure and fantasy part. The story is also good to help children imagine and dream.